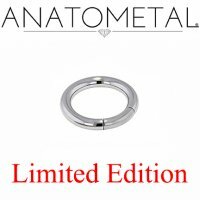 Manufactured by Anatometal using ASTM F-138 certified implant grade surgical Steel. This limited edition 8 gauge Segment Ring has 3/4" inner diameter and is hand polished to a mirror shine. Anatometal's surface finish is recognized as one of the best in the industry.